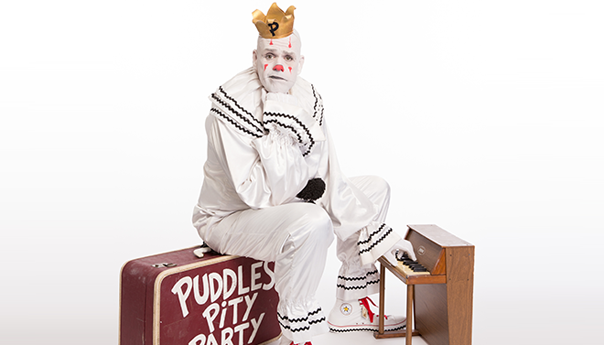 SAN FRANCISCO — Let’s get this out of the way up front: Puddles Pity Party is a nearly seven foot tall sad clown. He does not speak. A significant percentage of his show is about his obsession with Kevin Costner, including the preshow music which is all from Costner’s band. It’s the sort of thing that couldn’t exist on a national scale before the Internet. Even in the Vaudeville era, when touring acts seemed designed specifically for their novelty, it would be a hard sell from the synopsis alone. It’s hard to describe in a way that sounds in any way enticing. Fortunately, however, the Internet does exist and the profoundly weird can find its audience, because Puddles Pity Party put on an incredible show for a packed house at the Palace of Fine Arts Theater during SF Sketchfest presented by Audible. If you know one thing about Puddles from his run on America’s Got Talent or his breakthrough YouTube cameo it’s that he has an unexpectedly incredible voice. His booming, operatic, sonorous singing has wowed everyone from Simon Cowell to, perhaps even more impressively, the wretched hive of scum and villainy that is YouTube comments. Even with those expectations Puddles may actually sound better live. In an era where many, if not most, singers aren’t quite the same without AutoTune, he’s so good that your computer or TV speakers can’t do his voice justice. 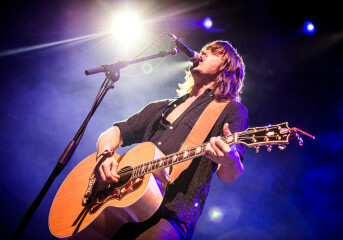 When he really hits a note, you can feel it in your chest. The sound of his singing alone, independent of the lyrics, is enough to make you emotional. His version of “Under Pressure” was right up there with Freddie Mercury himself, if you can even imagine. 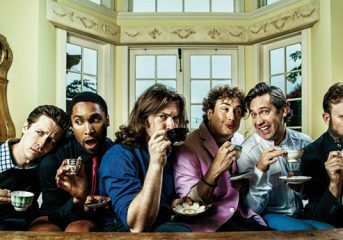 The songs would make it worth going by themselves, but this was a comedy show as much as, if not more than, a musical performance. And he succeeded at that too. It was a masterclass in physical comedy. Without saying a word he was hilarious beginning to end. 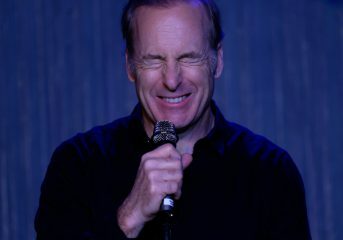 He began the show by stuffing an absurd amount of chewing gum in his mouth and reading a copy of People magazine with Kevin Costner on the cover. Then he took an inordinately long time to get his stool to center stage. All of that became running gags—the gum, laborious stool transportation, Costner—and despite the simplicity it never got stale. Once he got the stool where he wanted it he sat, back to the stage, and sang REM’s “Losing My Religion” while watching a montage of his time on America’s Got Talent. Following that he faced the crowd for “The Sound of Silence,” originally by Simon and Garfunkel, and set the tone with powerhouse performances on two very difficult, iconic songs. After that was a coffee break, for which he brought the first of many audience members onto the stage to participate. The audience participation, ranging from sipping coffee while he sang “My One and Only Love” to putting on a lab coat and pretending to be a rocket scientist while he sang “Space Oddity,” was a highlight. Whether it was a keen eye for volunteers, pre-selection or skillful performance on Puddles’ part, everyone chosen was hilarious. The best was a man who sang a karaoke version of “All By Myself” while Puddles sat off to the side and watched. The closest he got to original compositions were the lyrics of The Who’s “Pinball Wizard” sung to the tune of Johnny Cash’s “Folsom Prison Blues,” and later the words to “Folsom Prison Blues” sung to the tune of “Pinball Wizard.” And both worked! Somehow those two wildly dissimilar songs are entirely interchangeable. And that really encapsulates the mad genius that is Puddles Pity Party. None of it should work, nothing about it should make sense, and yet it comes together flawlessly. For all the Internet’s faults, we’re lucky to live in a time where something like that can break through.